My go-to frosting is usually Swiss meringue buttercream. (You can find evidence of it here and here.) I dislike American buttercream, which is the typical butter and confectioner’s sugar concoction that you see at most (overpriced) cupcake bakeries. Because SMBC (yes, an acronym for buttercream!) doesn’t rely on sugar for structure the way American buttercream does, it allows you to control the sugar as you first create a meringue then add butter. The only problem with SMBC is that sometimes it’s too, well, buttery-textured. Sometimes this is appropriate, like with a light spongy cake, but with a buttery butter cake, it can actually be too much. I know y’all love your butter, but still. 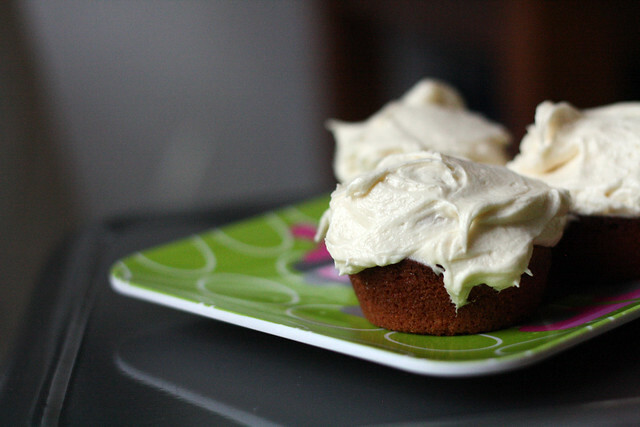 So I was really pleased to find a recipe for a creamier-tasting frosting that just happens to be a classic. Ever hear of “ermine frosting”? It’s the classic Southern topping to red velvet cake, before that interloper cream cheese frosting took over as the modern standard. Ermine frosting is also what’s known as boiled milk frosting. Sounds appetising, doesn’t it? Actually, all the names of this frosting are highly unappetising. Ermine makes me think of a cake covered with fur coats, boiled milk speaks for itself, and its traditional name of “gravy icing” makes me consider serving it with a roast chicken. No wonder Cooks Country called it “miracle frosting” when they published a recipe for it in 2008. Names aside, the frosting is basically a starch pudding, a flour and milk-based roux with butter added once it is cooled. It doesn’t require eggs, but its body comes from the initial pudding. Pudding frosting sounds nice, doesn’t it? It still calls for quite a bit of butter, but somehow resembles more of a sweetened cream frosting rather than a traditional buttercream. So add this to your frosting arsenal. It’s great with buttery cupcakes (here’s my easiest go-to recipe for vanilla cupcakes) and as a filling for whoopie pies. Or, of course, for red velvet cake. Combine the sugar, flour, cornstarch and salt in a medium bowl. Whisk in the milk. Strain the mixture through a fine-mesh strainer into a medium saucepan. Cook over medium heat, whisking constantly until the mixture boils and thickens. (This takes me about 7 minutes.) It should be the consistency of a very thick pudding. Stir in the vanilla. With a mixer with a whisk attachment, beat the milk mixture on low speed, adding the butter one piece at a time. When all the butter has been added, increase the speed to medium-high and beat until fluffy, about 5 minutes. Allow the frosting to sit at room temperature about an hour, until stiff. This sounds like a really nice alternative to SMBC because I don’t care for the sugar-based frostings. What would you suggest to do to make this recipe a dark chocolate version? I use 30g of cocoa and a handful of dark chocolate plus a dash more milk to my original amended recipe and it works beautifully .. Thank you for the info Sheryl. I can’t wait to try it! I can’t tell you how long I’ve been looking for an alternative!! !